Conservative activists around Texas are citing a 1992 U.N. resolution called Agenda 21 in protesting various local development initiatives. 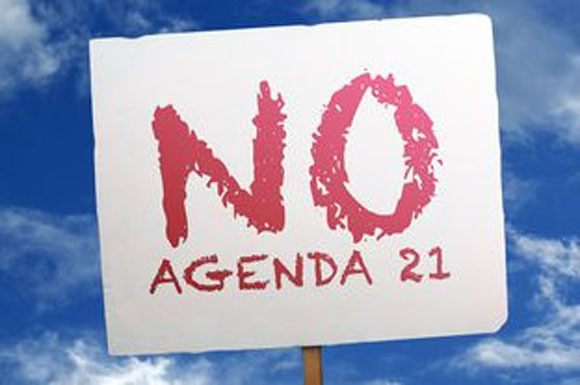 Agenda 21 is a non-binding resolution that promotes sustainable development. A Lubbock County judge’s comments last week that President Obama might cede U.S. sovereignty to the United Nations and spark a civil war have been widely ridiculed. But concerns about U.N. overreach are gaining ground, with the attacks mostly focused on a 20-year-old nonbinding U.N. resolution called Agenda 21. Texas critics of the resolution have seen their fears echoed by activists at city council meetings around the state and adopted by some of the state’s Republican leaders. Such issues have become of particular concern in fast-growing Texas. Many regions are struggling to integrate a steady stream of new residents while avoiding gridlocked roads and retaining communities’ character. Dean Almy, director of the graduate program in urban design at the University of Texas at Austin, has taught classes on Agenda 21, and described the resolution’s 1992 adoption as an important moment in the history of urban design. The Republican National Committee adopted a resolution in January against Agenda 21 as “a comprehensive plan of extreme environmentalism, social engineering, and global political control.” The Texas Republican Party followed suit at its state convention in June, adding opposition to Agenda 21 to the party’s platform. Almy said Agenda 21 has traditionally had greater sway in other countries, where some cities will explicitly cite the resolution in their development plans. Yet over the past year, he’s noticed it cited frequently by conservative activists and groups in Texas and other states amid protests on sustainability projects. Houston City Councilwoman Helena Brown cited Agenda 21 in voting “no” on some energy-efficient building projects in April. “It is an insidious, extreme institution that does not represent our citizens, and for our taxpayers to continue to fund it would be ridiculous,” Fields wrote on his blog. Cruz really said that? Is he going to work to shut down the Girl Scouts, and Boy Scouts conservation merit badges? Will Cruz work to kill the 4-H Clubs, and Future Farmers of America? They support the same stuff — if he regards those essentially-American groups as “tentacles of the United Nations,” he’s way too radical for Texas, and America. Where does he get that stuff? What insanity. I don’t know Ed. I got the article from Pakalert Press. It’s news. A lot of very very bad stuff is going on right now. It’s a shame…isn’t it? All we can do is just keep on praying. God bless you.